Who's Missing From The Suns Lineup? After driving through rain shower crossing into MD from VA, the sun gave way to blue skies in time for the game in Hagerstown. With baseball being a game of ritual and routine, to your right is what I saw when I went to look at the lineups for the night. With the news coming across Twitter that Craig Stammen had been recalled, the immediate thought was that Harper had been given the bump as part of a chain reaction. Nope. Just a night off. So it was time to focus on what had been a bonus, but still a treat: seeing Sammy Solis in person. Unfortunately, while folks may have questioned his placement at Hagerstown after pitching well in the Arizona Fall League, and particularly after the Potomac rotation was in such disarray (though lately, it’s been quite in array after back-to-back CGs). Two long home runs in the first inning were explanation enough. He needs to fine-tune his game before he returns to his level. Solis would also run into trouble in the third inning, walking the bases loaded to three successive batters, then striking out two of three to get out of it. He even took an infield popup himself for an out. Solis would be done after five innings, the three first inning runs on the two home runs allowed on four hits total with the three walks and six strikeouts. His velocity seemed fine (couldn’t peek at any guns from my vantage point) and his curve, an 11-5 (1 to 7 from the batters viewpoint) had a sharp break to it that the Drive couldn’t touch. Meanwhile, Greenville’s Kyle Stroup was having the kind of night that one might have otherwise expected from Solis, holding the Suns to just two hits over six innings before giving way to the bullpen. He would walk two and hit a batter but retired the leadoff batter in every inning, something the Drive managed 11 times out of 12 last night. Despite their problems getting runners on, the Suns broke through in the bottom of the eighth. Adrian Sanchez got a bad-hop single past the vacuum cleaner Drive SS Jose Garcia, who had seven putouts and an assist for the night. Blake Kelso served up his second opposite-field single to right to set up a first and third for catcher Davd Freitas. The Univ. of Hawaii product fouled off several pitches before he got one he could handle, which he deposited to left-center for a game-tying home run, and perhaps some Greenville Drive bloggers hitting the delete key on the gamer that they thought was safe to start writing. Unheralded elsewhere, but given a mention here was the three scoreless innings of middle relief that made Freitas’s heroics even possible. Matt Swynenberg may not have been flashy, but he got the job done, enabling the three back-end-of-the-‘pen relievers a chance to get the glory. Remember that Bryce Harper kid? Well, turns out he may not have started but he got a chance to play. With one out in the ninth, he pinch hit for Kevin Keyes, a chance to be the hero. After working the count full, well, you can see for yourself. I show you this so you can see for yourself how he handled himself, which was like any other minor-leaguer: a professional. Ben Graham followed Swynenberg with two solid innings of work, escaping a two-on, one-out jam in the 10th with back-t0-back popups to Kelso and Jason Martinson. Chris Manno took over in the 11th and got torched a long double to center by Miles Head, who hit the first HR in the first. Manager Brian Daubauch ordered an IBB to Brandon Jacobs, who hit the second HR in the first, and Manno struck out the next two batters and got a grounder to escape the jam. The lone leadoff hit of the night for the Suns came when Brett Newsome doubled in the 11th. Jason Martinson couldn’t move him over (he swung away) to bring up Harper. Greenville wisely filled the open base at first to go after Mills Rogers instead, who struck out while Michael Taylor lined out to end the threat. Greenville finally got to the Suns ‘pen in the 12th, as Manno struck out two and walked two before he was lifted for side-arming Neil Holland. With two outs and two strikes, Drive catcher Josue Peley singled sharply to center. Michael Taylor fielded it and gunned it in, but the throw hit the mound and took a bad hop, evening the lucky break Hagerstown got in the 8th for what proved to be the game-winning run. 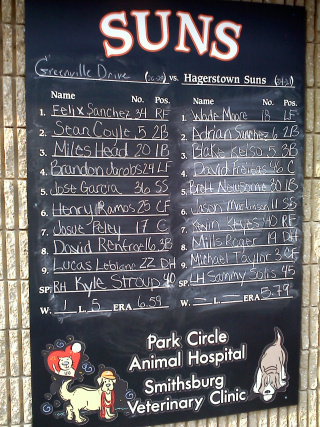 With the loss, Hagerstown’s lead over second-place Greensboro was shaved to 1½ games, the two teams set to battle for first place over the next three days before the Suns hit the road on Thursday (Wednesday is an off day) for a seven-game swing through Delmarva and Lakewood. Keys did get hit in the hand with the pitch the inning before, but went out to play the field. When his spot came up, it was “natural” to slide Harper in IMHO. At least when Harper fails at the plate, he’s not going in the dugout and destroying anything in his way. It was almost a sure bet early in the season he’d break a bat or slam a helmet somewhere. Figures our middle relief actually pitches ok when Sue was there. LOL I was happy to see Manno pitch after a few games of inactivity. Regardless of how he pitched last night, he’s got the goods to go lots further than Hagerstown. He shows good stretches, not flashes, of pinpoint control and veolcity changes that batters seemingly can’t figure out. So you snuck up to Harrisburg & saw a lot of ‘the Young Dudes’. Any first impressions on some of them defensively (i.e. Freitas behind the plate, Keyes & Moore in the OF, Martinson at SS)? …Martinson looked smoother in the field than his error total would suggest. …Adrian Sanchez looked as good as Kobernus or Lombardozzi on defense. …Kelso is all about grit and hustle. A lot of these guys are. …Freitas gunned down the only runner that tried to steal but couldn’t block a pitch in the dirt. Not sure if I can make a snap judgment on that, but he has the same path as Norris in terms of when and where he’s played catcher. …Manno produces a lot of velocity for such a little windup and has a funky hop-step motion that clearly rattles the batters. I tried to get video of it w/ my phone, but it’s not very good — lesson learned, use the FlipCamera. I’m no expert in mechanics but I think putting him in the ‘pen may be the best use for such a delivery. The coach took Manno out because his pitch count was getting up there. Seems like a bad decision. He’s gotten himself out of stickier binds than last night. Also the ump wasn’t giving him any leeway on the plate. nothing. nada. I do agree w/ TBR–they just weren’t hitting him. Also bad pitching call–bringing Neil Holland (side-arm righty) against a Lefty batter. Just doesn’t make sense. Actually, it was a switch-hitter who hits better right-handed than left-handed so they wanted to turn him around. I felt like Manno was laboring and that pulling him was the right decision. Whether or not using Paul Applebee, the only other lefty in the ‘pen, is certainly a valid point if he was indeed available. Thanks for the scouting, Sue, this is a very promising group.